For This Child I Prayed: what's in a name? If you've had a child you know that thinking up, agreeing on, and settling on a name that your child will be called for the rest of his/her life is a daunting task. One that is fun and exciting, but one that can also be a bit stressful. Fortunately, Trey and I have been able to decide on our girls' names pretty quickly. If you didn't already know, we named our first daughter Megan Lael.Megan, after my sister, Megan, and Lael, a Hebrew word that means,"Belonging to God". We call her by her middle name, and some family members call her by both names. The significance and meaning of a name means a lot to us. We want to be able to tell our daughters when they are older why we picked out those particular names and what they mean to us as a family. We had a few names on the list for a girl before we found out she was a girl, and right before our ultrasound we added another name, a name that became a front runner for me. We looked up the meaning of it, and I was pretty much sold. During the ultrasound, after finding out that she was a girl, I found myself calling her by that name in my mind as I watched her wriggle around on the screen. I kept it to myself though, and wondered what Trey's opinion was on the matter. Once we got in the car to head home Trey said, "Babe, I think 'Ruthie' is the name. When I saw her on the screen she just looked like 'Ruthie'." His thoughts had been my thoughts. Patricia is my mom's name and I have always wanted to use it because I think it's beautiful and I love my Momma. I'm so thankful for her and the example that she has set for me as a mother. She has always been there for me no matter what, was a shoulder to cry on and a friend to rejoice with. She never ceased to point me towards Christ. So, with that being said our desire was to honor her by giving our daughter her name. Not sure, but you may have heard of the name Ruth. She only has her own book of the Bible and all. :) It is, like Lael, Hebrew, and it means "friend and companion". We love this because our hope and prayer is that little Ruthie will be our little Lael's favorite friend and companion. And vice versa. Close in age and in heart. We realized that we are beginning a trend with our childrens' names. Family name first, Hebrew name second, and call them by their second name. We figure it's just meant to be that way. Why? Well, Ruthie may hate us for it later when she's getting married and has no idea what to do with all of her names... 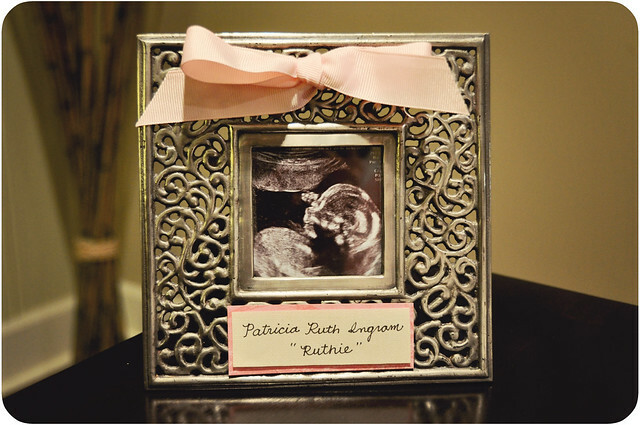 BUT, not as much as she would have hated us for naming her Ruth Patricia Ingram and her monogram being RIP. Yep, I'm thinkin' she's gonna thank us for that one. For my birthday (which was on the 5th- more on that later), we decided to give my mom a gift. A "thanks for giving birth to me" gift, if you will. I got to thinking about it... I don't think we recognize our own mothers enough on our own birthdays! After giving birth myself, I realized this. The day Lael was born will always be much more of a day of remembrance for me than it will be for her. A day and a moment burned into my memory for as long as I live. 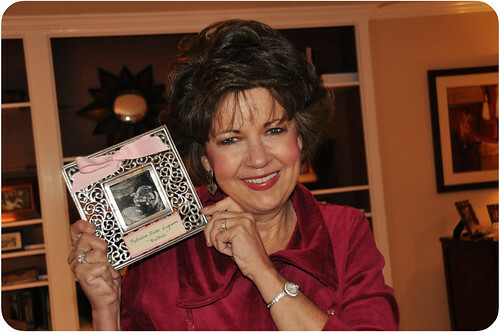 So, on my birthday we revealed to my mom the name of our littlest girl. Here's my mom with "Baby Ruth". Ruth is one of my favorite names! I can't wait to meet this little bundle of joy! (: And, I'm sure Lael is going to be a wonderful big sister! I love hearing how people choose names! You've got great meaning and it's so personal I love it! That is such a beautiful name! And I love Lael too! Sweet name. It's always fun to hear how mommies & daddies pick the names. I always call my mama on my birthday at exactly the time I was born & tell her "Thanks for giving me life!". I've done this for about 10 years, even before my son was born. It means even more to me to do that now than it ever did, though. I love how you presented your mom with her name, too!